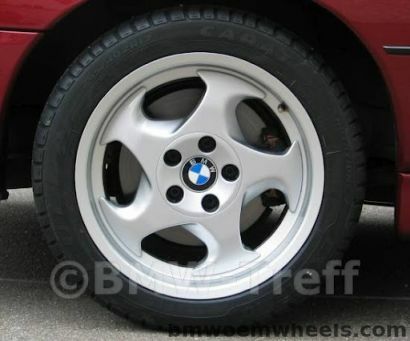 This set of four BMW Style 21 wheels represent a very interesting design primarily used on the E34 M5. Directional “throwing star” shaped covers give the wheels their nickname, though their real purpose is to extract hot air from around brakes, resulting in less fade and better performance when really pushing. These would look fantastic on an E34 M5 of course, but we’ve also seen them working very well on E31 8-series coupes, E28 M5’s and many other 80’s and 90’s BMW’s.These wheels part number for the is 36 11 2 226 706. Official wheels name M System II.